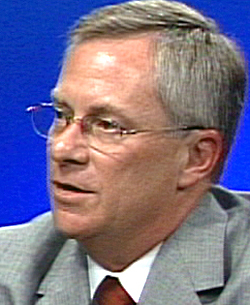 Jim Hicken in a 2004 episode of SCVTV's "Newsmaker of the Week," shortly after he and Frank Di Tomaso opened the Bank of Santa Clarita. The Bank of Santa Clarita announced the sudden departure Monday of its founding president, James D. Hicken. The bank made the announcement in a brief statement that came after the end of the business day. It said Hicken’s last day on the job was Friday, April 6. Bank officials could not be reached after hours for comment. Hicken served as president and CEO since the bank opened in 2004, with Frank Di Tomaso serving as chairman of the board. Monday’s announcement said Di Tomaso will assume the role of chief executive on an interim basis until a replacement is found. Hicken is one of the Santa Clarita Valley’s most prominent and visible bankers. The SCV Zonta Club honored him last fall for his philanthropy at a fundraiser where Hicken helped raise money to improve the status of women. Hicken held executive roles at Union Bank and Valencia National Bank before leaving to form the Santa Clarita Valley’s only locally headquartered bank. Over the past 7-1/2 years he helped grow the bank into a full-service deposit and lending institution with branches on Magic Mountain Parkway and Golden Valley Road. Last year the bank announced plans to move its headquarters out of a commercial strip center in Valencia and build its own, self-standing headquarters building in the Santa Clarita Valley. The bank’s most recent balance sheet showed improvement, with net earnings of $223,000 for the quarter ending Feb. 29, versus $104,000 for the same period in 2010. However, full-year profits lagged. Net earnings for all of 2011 were $381,000, compared to $569,000 for 2010. The decrease was attributed primarily to a $250,000 penalty for the early termination of the lease on the current headquarters building as the bank prepares to build.